Daalder Exhaust & Towbars, established over 35 years ago, are specialists in supplying & installing all types of Towbars, Performance, 4x4, Truck, Standard Replacement Exhausts & Emissions Devices (Catalytic Converters, DPF’s, etc), not to forget mufflers for most makes & models. Get in touch with us to discuss your towbar or exhaust requirements, we’d be happy to talk you through the options available for your specific need. Call Alan or Wayne today on (03) 9791 8455. We stock a large range of Hayman Reese towbars, Boronia towbars, sway controllers, weight distribution systems, electronic brake controllers and towing accessories. If we haven’t got it in stock we can source it quickly to get your job done to suit your schedule. When it comes to exhausts we are an authorised installer of Redback Extreme Duty 4x4 Exhausts and Tunit Diesel chips. Quality products that improve the power, performance and fuel economy of your 4x4. We also offer numerous other brands to suit your particular needs. Our experienced team can advise you on the best option to suit your requirements, and our qualified tradesmen can quickly & expertly install your chosen product at competitive prices. 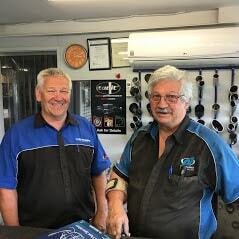 We are a locally owned family business and are proud to be a member of the Carline Automotive & Exhaust Group, Australia’s Premier Exhaust Specialists, giving our customers additional peace of mind with the best deals & national warranties in the industry.